Abstract: Legume-based leys (perennial sod crops) are an important component of fertility management in organic rotations in many parts of Europe. Despite their importance, however, relatively little is known about how these leys affect weed communities or how the specific composition of leys may contribute to weed management. To determine whether the choice of plant species in the ley affects weeds, we conducted replicated field trials at six locations in the UK over 24 months, measuring weed cover and biomass in plots sown with monocultures of 12 legume and 4 grass species, and in plots sown with a mixture of 10 legume species and 4 grass species. Additionally, we monitored weed communities in leys on 21 organic farms across the UK either sown with a mixture of the project species or the farmers’ own species mix. In total, 63 weed species were found on the farms, with the annuals Stellaria media, Sonchus arvensis, and Veronica persica being the most frequent species in the first year after establishment of the ley, while Stellaria media and the two perennials Ranunculus repens and Taraxacum officinale dominated the weed spectrum in the second year. Our study shows that organic leys constitute an important element of farm biodiversity. In both replicated and on-farm trials, weed cover and species richness were significantly lower in the second year than in the first, owing to lower presence of annual weeds in year two. In monocultures, meadow pea (Lathyrus pratensis) was a poor competitor against weeds, and a significant increase in the proportion of weed biomass was observed over time, due to poor recovery of meadow pea after mowing. For red clover (Trifolium pratense), we observed the lowest proportion of weed biomass in total biomass among the tested legume species. Crop biomass and weed biomass were negatively correlated across species. Residuals from the linear regression between crop biomass and weed biomass indicated that at similar levels of crop biomass, grasses had lower weed levels than legumes. We conclude that choice of crop species is an important tool for weed management in leys. In agricultural production, nitrogen is a key nutrient for achieving acceptable yields and crop quality . Due to globally rising costs of mineral nitrogen fertilizer and concerns over the negative environmental impact of anthropogenic nitrogen [2, 3], agricultural policy makers, farmers and scientists are increasingly paying attention to the use of leguminous plants as an alternative source of nitrogen [4, 5]. Through their symbiosis with rhizobacteria, legumes are able to fix atmospheric nitrogen  and convert it to a form that is readily available to plants . After incorporating (e.g. ploughing) legumes into the soil, nitrogen accumulated in the plants’ above-ground and below-ground residues is broken down by microbial activity and released for uptake by the following crop . This use of legumes for fertility-building in the rotation is common in a variety of farming systems, e.g. where the use of mineral nitrogen fertilizer is considered to be too expensive, or, as in organic agriculture, where it is not permitted [9, 10]. Both grain legumes and forage legumes are used for fertility building. Because of its function as the main nutrient provider, the use of forage legumes in the rotation, which in Europe is frequently referred to as the ley phase, is of central importance for certain organic (and also increasingly non-organic) farming systems. In Western and Central Europe, organic farmers most frequently use grass-clover mixes for their leys, with white clover (Trifolium repens) and red clover (T. pratense) being popular legume species, and perennial ryegrass (Lolium perenne) and Italian ryegrass (L. multiflorum) as commonly chosen grass species . Frequently, these leys are grazed or cut for silage or hay and incorporated into the soil by ploughing before sowing the next crop . Depending on various factors such as climate and soil conditions, the suitability of the land for arable production and the presence of livestock on the farm, the ley phase on organic farms can vary in duration from short term (1-1.5 years) to longer term (around 5 years), but typically the ley is maintained for about 1.5 to 3 years [10, 12]. A key requirement for high ley performance (e.g. as measured by above-ground biomass cumulated over time), and the subsequent provision of nitrogen to the following crops is successful establishment of the ley . Ideally, plants need to cover the ground quickly and establish well in a range of environmental conditions. However, according to a consultation of UK organic farmers conducted before the start of this study, white and red clover can be difficult to establish, especially under dry conditions . During the establishment period, weeds can play an important antagonistic role by competing with the sown legumes for light, nutrients and water [15, 16]. Also, annual weeds that exploit the space left by poor ley establishment are more likely to contribute to the weed seed bank in the soil and may therefore become a problem later, in the crop following the ley. For these reasons, the ability to outcompete weeds, either through a high competitive ability and vigour or through allelopathy, is a desirable trait in legume species for use in leys. At the same time, the lack of tillage during the ley phase means that an important tool for weed control in organic farming, namely the mechanical destruction and burying of weeds , is not available. Also, lack of tillage means that weeds are not stimulated to germinate, so that weed seeds remain in the seed bank. On the other hand, leys can be repeatedly mown or grazed during the ley phase, which provides an alternative tool for weed management . Using multiple species with complementary growth habits in a ley has the potential to further enhance weed suppression by exploiting differences in functional traits [19, 20]. For example, a fast growing early species that covers the ground quickly would complement a species that is taller and more competitive later in the season. Interestingly, leys appear to have the potential to increase weed seed numbers in the seed bank while simultaneously reducing weed emergence in the following crop; in a study on weeds in a wheat (Triticum aestivum) crop after lucerne (Medicago sativa)-grass leys or after potatoes (Solanum tuberosum) in Southern Germany, higher numbers of weed seeds in the seed bank were found after the ley than after potatoes, but a lower number of weeds emerged in the wheat following the ley . However, careful management is necessary to prevent the build-up of perennial weeds such as docks (Rumex spp.) and creeping thistle (Cirsium arvense) in leys [22, 23, 24]. Such species pose a potential problem not only for ley performance but also for subsequent crops and can pose a serious threat to productivity of organic crops [23, 25]. Despite the potentially negative effects of annual and perennial weeds in leys, the weed flora may simultaneously contribute to the farm’s biodiversity [26, 27]. Weeds provide vital resources for invertebrates and other wildlife [28, 29, 30, 31], thereby also helping to regulate pest populations in agro-ecosystems . In addition, some weed species in leys can be a source of mineral nutrients for livestock . Thus, weeds can be seen to provide a range of ecosystem services. However, these same services may also be provided by the crop, especially if multiple crop species in a ley are used. For example, including species with a variety of flowering times would extend the period of nectar and pollen provision . Ecological research on the function and diversity of weeds in organic farming systems has so far mainly concentrated on weeds occurring in arable crops [35, 36]. Where research has investigated the weed suppression by various small-seeded legume species, the focus has mostly been on the use of these legumes as short term cover crops [37, 38]. In contrast, current knowledge about weed diversity and weed control in organic rotational leys is limited. As part of a larger study on optimizing ley composition and management  we monitored the dynamics of weed communities in replicated and on-farm trials at multiple locations throughout the UK. Specifically, we asked: (1) Which legume and grass species typically used in legume-based leys show the highest competitive ability against weeds? (2) Which are the dominant weed species in typical organically managed leys in the UK? (3) What is the typical species richness of weeds (as measured by species richness) in organically managed leys? (4) Does crop species richness in the ley affect weed cover and weed species richness? The study was conducted over two years, starting in spring 2009 and consisted of two main experimental series. In series I, we set up replicated field trials at six sites across the UK, evaluating various legume and grass species in monocultures and in a multi-species mixture of legumes and grasses (Tables 1 and 2). Table 1 . Legume and grass species included in the trials: Latin and common name, variety, seeding rate (kg/ha), seed weight (Thousand Kernel Weight, TKW in g) and seeding rate in the monoculture plots and in the All Species Mix (ASM). * Inoc. Inoculation prior to sowing with Clover inoculum (C), Lucerne inoculum (L) and Vetch inoculum (V). Table 2 . Details of replicated trials: locations, plot sizes, sowing dates and pre-crops; * taken from one quadrat (50 × 50 cm) per plot; ** taken from three quadrats (each 50 × 50 cm) per plot. Table 3 . Details of on-farm trials: Geographic coordinates and soil properties. Figure 1. Photograph of an on-farm trial at Wakelyns Agroforestry, Suffolk, taken in the summer of 2010. On the left, slightly paler, the control ley (white clover-chicory-black medic mix), on the right the All Species Mix (ASM). A different site on the same farm was also used for replicated experiments. In series II, the same multi-species mixture was sown on 21 organic farms in the UK as non-replicated 0.5 ha strips alongside farmer-chosen control leys (Table 3, Figure 1). In the following text we call the series I trials “replicated trials” and the series II trials “on-farm trials”. In both series, trials were performed only once per site. Therefore, effects of year-to-year variation (e.g. effects of yearly differences in weather on weed emergence in the establishment phase of the ley) cannot be analysed. However, although effects of the age of the ley and the study year cannot be separated, this was at least partly compensated for by including a large number of trial sites in the study. Leys can be sown with mixtures of different plant species, which may provide insurance against the failure of individual species. In addition, mixing species is a way to combine desirable species-specific traits. To compose optimal species mixtures, a useful criterion for species selection is the functional complementarity of the different species [32, 40, 41, 42], with the aim of minimizing functional redundancy. According to this idea, we collected data on the ecological and agronomic traits of 22 legume species and five grass species from the literature [for details see ]. To assess complementarity, a principal component analysis (PCA) was conducted on traits of the 22 legume species (maximum height, flowering time, seed size, rooting depth, productivity, establishment and competitive ability, [see supplementary material of reference ]). The distance of individual species from each other in the PCA bi-plot was considered to be an indicator of functional divergence and potential for complementarity, in terms of coexistence and delivering multiple ecosystem functions when grown together in a mixture. Additional selection criteria included agronomic and practical aspects such as frost tolerance, resistance to grazing and seed availability of the species in the UK. As a result of this selection process we chose a subset of four grass species and twelve legume species with functionally complementary properties for the replicated and on-farm trials (Table 1). Further details of the selection process, as well as the identity of the non-selected species are given elsewhere . All four selected grass species, as well as ten of the twelve tested legume species, were combined in an ‘All Species Mixture’ (ASM) (Table 1), which was tested in both the replicated and on-farm trials. Two species (M. albus and V. sativa) were not included in the ASM because of concerns by the participating farmers about potential detrimental effects of these species on animal health or agronomic management. Seed densities of the monocultures were chosen according to general recommendations for the UK . The average plant density in the monocultures was 1180.5 plants m - 2 , whereas the total plant density in the ASM was 1811.1 plants m - 2 . The different densities mean that diversity or species richness effects cannot be separated from density effects in this study. In farming practice, however, density in species mixtures often exceeds the densities of their components [46, 47], but see ]. This is because on the one hand, an additive mixture is frequently considered to be impracticable as its density is too high and causes too much competition among plants, especially when including a large number of species in the mixture. On the other hand, a substitutive mixture may not make full use of the larger resource space available to the mixture. The relative seed rates of species in the mixture were chosen on a number of criteria including expected productivity, seed cost, and seed availability. In the replicated field trials we evaluated 18 treatments. In total, twelve legume species and four grass species were each grown singly as monocultures. In addition, two treatments were reserved for the ASM, which was grown both with and without Rhizobium inoculation (see below). At all six trial locations, the experiments were sown in spring 2009 (Table 2). All trials were laid out as single-factor randomized complete block designs with three replications. Following common practice, and to remove the possibility of any differences being due to lack of natural inoculum at sites, seed lots of the four clover species, V. sativa, M. sativa and one of the ASM treatments were inoculated with rhizobial preparations before sowing (Table 1), with 1 % (w/w) substrate per total seed weight. No suitable commercial inoculants could be obtained for the other legume species prior to sowing. The locations, plot sizes and sowing dates are listed in Table 2. Trial sites were distributed over a large geographical area within the UK. All trial sites were mown twice per year at 5-10 cm height, with the first mowing date after establishment in 2009 being between late June and early August (Table 1). In addition to the replicated trials, the inoculated ASM was sown by 21 organic farmers across the UK, including sites in East England, South England, North East Scotland and Wales. A further 13 sites were also included in the study, but data could not be included in the analysis because of incompleteness (e.g. sampling undertaken only in one of the two study years). Seed of the ASM was provided for a 0.5 ha strip which was sown by the farmers next to or within a control ley (Figure 1). Most of the 21 farmers sowed the leys in spring 2009, while some delayed sowing until later in 2009 for reasons of rotational planning (Table 3). On each farm, the management for the ASM and the control ley were identical (Table 4), but ley management differed among farms. The species composition and seed rates of the control ley were chosen by each farmer individually and differed greatly in the species richness of the sown mixtures (Table 4). On 16 of the 21 farms white clover was included in the control ley. Weed and crop species were assessed for percentage cover several times during the trial duration, using 0.25 m 2 sectioned quadrats. Within the replicated trials (series I), visual cover assessments were carried out at one of the sites only (Barrington Park), by estimating percentage ground cover five times over the trial period in two quadrats per plot. In the on-farm trials (series II), all weed and crop cover assessments were carried out with a 0.25 m 2 sectioned quadrat. On each farm, cover was assessed in four locations within each treatment, i.e. both in the ASM strip and in an adjacent strip of the control ley, resulting in eight assessment points per farm and date. Sampling locations were chosen randomly but at least 10 m were left between any two assessment points. Assessments were performed twice per farm: in 2009 several weeks after sowing (i.e. late spring in most cases) and in the following year at a similar time in the growing season. Although this method, with a relatively small total sampling area per farm and low temporal sampling frequency, did not allow us to build complete species lists for each trial area it did provide information about the most frequent weed species. Table 4 . Management details for on-farm trials. In most cases, weeds were identified to species level. Where this was not possible, individual plants were assigned to a species group. For example, docks (Rumex spp. ), could not always be assigned to R. crispus L., R. obtusifolius L. or the hybrid R. crispus x obtusifolius. Therefore, all docks were summarized under Rumex spp. However, where differentiation was possible, R. obtusifolius was the most dominant taxon. Volunteer crops, such as potato (Solanum tuberosum L.), wheat (Triticum aestivum L.) and oats (Avena sativa L.), which were encountered in weed assessments were excluded from further data analysis. In the replicated trials, above-ground biomass samples were taken in 2009, 2010 and 2011 on five of the six trial sites (Table 2). Quadrats for sampling biomass had a size of 0.50 x 0.50 cm and were randomly placed within plots; along the length of the plots, the outermost 1 m was avoided for sampling to minimize edge effects. Sampling quadrats were aligned diagonally in the plot. Sampling was performed on one sampling quadrat per plot (2009, 2010) or three quadrats per plot (2011). While the samples were still fresh, weeds were manually separated from crops and the weed and crop fractions were separately dried at 80 ∘ C until sample weights were constant. The timing of sampling in 2011 was chosen to reflect the situation directly prior to incorporation of the ley into the soil. Immediately prior to sowing in 2009, soil samples were taken on all trial sites, including the on-farm trials. Soil samples were collected across the field with a soil corer to a depth of 15 to 20 cm (i.e. the typical depth of ploughing in the study area) and then bulked into a single composite sample. Individual corer samples were obtained on each trial field when walking the field in a W-shape with sampling points 2 to 4 m apart. The samples ( > 300 g) were air-dried and analysed at Natural Resource Management Ltd (Bracknell, UK) analytical laboratories. Samples were analysed for soil texture (percentage sand, silt and clay) using pipette sedimentation. Textural classes followed the UK Classification (Sand 2.00–0.063 mm, Silt 0.063–0.002 mm, Clay < 0.002 mm). Soil organic matter was determined using the wet oxidation Walkley Black colorimetric method. Plant available P was determined according to Olsen at 20 ∘ C; plant available K was extracted using 1 M NH 4 NO 3 and K concentration was determined by flame photometry. Available Mg was extracted using 1 M NH 4 NO 3 and Mg concentration was determined using AAS. Geographic coordinates (latitude, longitude and altitude; Table 3) of all sites were obtained from publicly available digital maps. Management data such as sowing and cutting dates were requested from the participating farmers. All statistical analyses were performed with the program R, version 2.14.1 . We compared the cover in the ASM with the average cover from all component monocultures, either weighted or not weighted by the respective seed density in the ASM. The weighted average of weed cover was calculated as follows. If s i is the seed rate of species i (in g m - 2 ) in the ASM; and w i is the weight per seed for species i (in g); then n i = s i / w i is the number of sown plants per m 2 of species i within the ASM. The relative proportion p i of the species i in the ASM can then be defined as p i = n i / ∑ i n i . If c i is the weed cover in plots of crop species i (in %), the average weed cover c w across the monocultures of all species that constitute the ASM, weighted by the proportion of species within the ASM is c w = ∑ i c i ⁢ p i , whereas the unweighted average of the weed cover is c u = ( ∑ i c i ) / m , where m is the total number of species in the ASM. Proportions of individual species within the ASM (measured by the relative number of sown plants) were relatively high for white clover (0.166), large birdsfoot trefoil (0.138) and birdsfoot trefoil (0.115), and relatively low for meadow pea (0.001), sainfoin (0.014) and Italian ryegrass (0.019). The weighting by the relative seed density in the ASM was performed to account for the unequal proportions of individual species in the mixture. Specifically, assuming that the effects of individual species on weeds increases with their proportion in the mixture, the expected weed cover in the ASM (in the absence of any effects of diversity or absolute seed density) would be equal to the proportional weed cover values in all constituent monocultures, i.e. 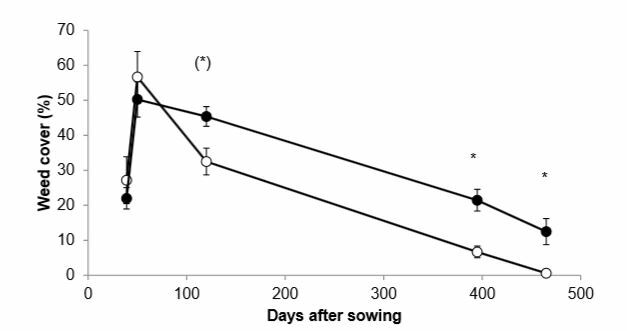 c w . Differences in weed cover between ASM and the unweighted or weighted average of the monoculture were tested with linear mixed effects models using days after sowing as continuous random effect. Because this analysis revealed significant time x treatment interactions, treatment effects were analysed for each time separately with one-factorial analyses of variance. Block effects were non-significant in all cases of this analysis and were removed from the model. Normality of model residuals was checked with the Shapiro-Wilks test. No significant deviations from normality occurred in the weed cover data in the replicate trial. In the on-farm trials, weed cover data were analysed with analysis of variance to test differences between ASM and control ley. However, weed cover data from 2009 and 2010 was found to be significantly non-normal ( P < 0.001). Since non-normality of the 2009 data could not be removed by (logarithmic) data transformation, a non-parametric sign test was applied to data of both years. This test assesses the significance of the direction of the difference between ASM and control ley. In addition, the 2010 weed cover data was log-transformed and the transformed data subjected to an analysis of variance. Weed biomass and crop biomass in the replicated trials was analysed in the following way. To account for strong site effects in weed and crop biomass, we first calculated for each plot the relative differences (in weed biomass and crop biomass) between individual plot data and site means, i.e. for weeds W * = s , b , i ( W s , b . i – W s ) / W s 100 % , where W * is the relative difference in weed biomass from the site mean for species i at site s in block b; W s , b . i is the absolute weed biomass for species i at site s in block b; and W s is the site mean of absolute weed biomass across all species and blocks. Analogous calculations were performed for crop biomass to determine relative crop biomass as C * = s , b , i ( C s , b . i – C s ) / C s 100 % . Further, to determine the relationship between relative weed biomass W * and relative crop biomass C *, we performed a linear regression of W * i against C * i across species; in order to avoid inflation of degrees of freedom and to account for non-independence of data within sites, values of C * s , b , i and W * s , b , i were averaged across sites and blocks for each species prior to the analysis of linear regression. In a subsequent analysis, residuals of individual species values from the linear regression function of W * against C * were tested for significance based on a mixed-effects model with site as a random factor, using the lme function in R.
To compare the various species with regard to, K i = W i / ( C i + W i ) , i.e. the proportion of weed biomass in total above-ground biomass, the data from all sites was analysed with a linear mixed-effects model with site as a random factor followed by Dunnett’s test to separate means of individual species from the means of a set control species; these control species were chosen as white clover for the legume species and perennial ryegrass for the grass species, because these species had been found to be most commonly used by the organic farmers participating in the study (Table 4). The temporal change of the proportion K i ⁢ s of weed biomass in total biomass was analysed by comparing K i ⁢ s from the last biomass sampling date against the first date (2011 vs. 2009). For each species, the absolute difference in K i ⁢ s between the two dates was tested for the direction and significance of change by a two-tailed t-test against zero, based on a mixed-effects model with site and block within site as random factors, using the lme function in R. To make comparisons among legume species, white clover was considered as a control and the difference between this species and all other legume species was tested with a multiple (many-to-one) comparisons test after Dunnett; the same test was employed to test the difference between perennial ryegrass and the other grass species. Weed floristic similarity between the two study years, based on presence versus absence of individual species in each of the two years, was compared using Jaccard’s index with confidence intervals given by Real ; Jaccard’s index ranges from 0 (no similarity) to 1 (maximal similarity). For individual species, the change from the first to the second study year in the number of farms or quadrats on which the species was found to be present was tested for significance with χ 2 tests protected with a Bonferroni correction for multiple testing. Weed cover at the Barrington Park site rose sharply in the first two months of the trial and then declined gradually over the remaining duration of the trial (Figure 2). At the two later assessments, weed cover in the ASM (c A ⁢ S ⁢ M ) was significantly lower than in the weighted average c w of the component species. The comparison between weed cover in the ASM and the unweighted average c u of the weed cover in the monoculture yielded similar results, with c A ⁢ S ⁢ M being significantly lower than c u at the last three assessment dates. However, it was not possible to separate the weed-reducing effect of increased plant density in the ASM from effects of species richness, e.g. through increased weed suppression due to complementarity of growth habits of the component species. In the on-farm trials, average weed cover was 10.6 % in year 1 and 5.1% in year 2. Weed cover was not significantly different between ASM and Control ley in either of the two trial years following a sign test; also, no significant difference between ASM and control ley was found for log-transformed weed cover data from 2010, following analysis of variance. Figure 2. Development of estimated weed cover (%) over time in a complex species mixture of grasses and legumes (All Species Mix, ASM, open circles); and in the average of the ASM’s component species when grown in monocultures (weighted by relative plant density in the ASM, filled circles); average over three replicates and standard errors (error bars); (*): P < 0.1; *: P < 0.05 (t-test). The legume species with the strongest weed suppression was red clover (Figure 4). For this species, the proportion of weeds in total biomass at the first sampling was 28.3 % ± 9.9 % across sites. Averaged across all legumes, the weed proportion in total biomass at the first sampling was 56.0 % ± 7.6 %; for the grasses, this value was at 33.2% ± 7.0 %. 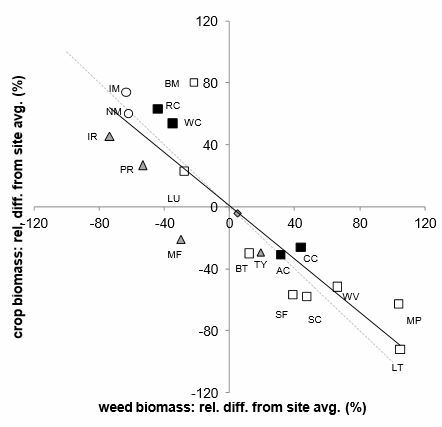 There was a strong and highly significant negative relationship between above ground crop biomass and weed biomass across species (Figure 4; Adjusted R 2 = 0.78, P < 0.001, df = 16). Interestingly, all four grass species were left of the regression line, i.e. their weed-reducing effect was higher than would be expected from their above ground crop biomass. To test the significance of deviations from the regression, a mixed-effects model with site as random factor was run, followed by a t-test on the difference between observed values and values estimated from regression line shown in Figure 4. According to this analysis, there was a significantly higher weed suppression ability in grasses than in legumes ( P < 0.001). 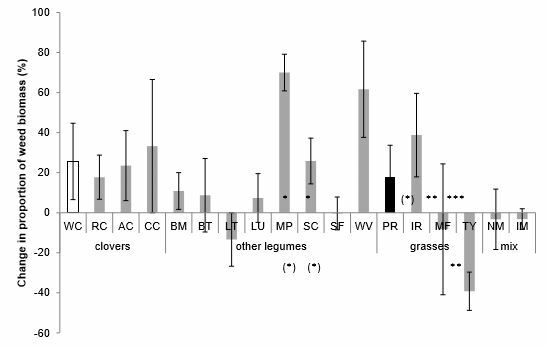 When individual grass species were tested, the deviation from the regression line was only significant for F. pratensis, ( P < 0.01), but overall, L. multiflorum had the highest crop biomass and lowest weed biomass (Figure 3). This indicates that the characteristics of species shown in Figure 3 (relative crop biomass and weed suppression) were mostly consistent over the two years of the study, since the proportions of weeds in total biomass remained largely constant over time (with the exception of Timothy grass). We observed a nearly significant (0.05 < P < 0.1) increase in the proportion of weed biomass over time in only two of the legume monocultures, meadow pea and white sweet clover (Figure 4). Among the grass species, the proportion of weeds in the biomass significantly decreased in Timothy grass from autumn 2009 to spring 2011 ( P < 0.01). In most species, the proportion of weed biomass within the total above-ground biomass did not significantly change over time, i.e. the absolute temporal change in the weed proportion, over the period of autumn 2009 to spring 2011 was not significantly different from zero (Figure 4). In total, 63 weed species were recorded in the leys. With a total of 56 weed species found in the first year of the ley, the species richness was twice as large as in the second year, when only 28 species were recorded. Similarly, the number of weed species per farm was higher in the first than in the second year, with 11.9 ± 1.6 and 3.8 ± 0.7 weed species per farm, respectively (average ± standard error). Floristic similarity between the two study years (2009 and 2010), as measured by Jaccard’s index on species presence in either of the two years, was found to be 0.344; this was not significantly different from random similarity or dissimilarity according to confidence intervals given by Real . The total number of weed species found on each farm, in both years together, ranged from 3 to 27. Weed species numbers between the first and the second years of the study were uncorrelated across farms (linear model, adjusted R 2 = 0.08 , P = 0.14 , d ⁢ f = 16 ), i.e. farms with a higher number of weed species in the first year did not necessarily tend to have a higher species number in the second year as well. Weed species richness did not correlate with the crop species richness sampled in the ley (Adjusted R 2 = 0.007 , P = 0.247 ), indicating that increasing the number of species within in a ley mixture does not compromise the conservation of wild farmland plants. Similarly, for both 2009 and 2010, the number of weed species was not significantly different between the ASM and the Control leys. In the first year of the ley (2009), the most frequently encountered weed species were chickweed (Stellaria media), sow thistle (Sonchus arvensis) and field speedwell (Veronica persica) (Table 5). In the second year of the ley, almost all annual species decreased in frequency, i.e. the proportion of farms and of quadrats on which they were present decreased over time. Conversely, some perennial species such as dandelion (Taraxacum officinale agg.) and creeping thistle (Cirsium arvense) increased slightly but non-significantly in frequency. However, C. arvense, as well as the other weed species Rumex spp. with recognized economic relevance in organic agriculture, were relatively infrequent, being recorded in only 9 to 16 out of 168 sampling quadrats (Table 5). Figure 3. Proportion (in %) of weed biomass in total biomass (above ground): Absolute change from autumn 2009 to spring 2011; means and standard errors across 4 sites. Positive values mean an increase in the proportion of weed biomass in the total above ground biomass over time. Significance stars below the zero-line indicate whether this temporal change was significantly different from zero (t-test); stars above the zero-line refer to the difference between white clover (white bar) and the other legume species and or the difference between perennial ryegrass (black bar) and the other grass species (Dunnett-test). (*): P < 0.1; *: P < 0.05; **: P < 0.01; ***: P < 0.001. For abbreviations see Table 1. Table 5. Weed species found in year 1 and 2 of the ley on 21 organic farms: Number of farms and number of quadrats in which the weed species were present, sorted in descending order by the number of quadrats in 2009 on which the species was present; (a) species with presence on a total 10 or more sampling quadrats; (b) species with presence on a total of fewer than 10 quadrats. For individual species, the change from the first to the second study year in the number of farms or quadrats on which the species was present was tested for significance with χ 2 tests protected with a Bonferroni correction for multiple testing (***: P < 0.001; **: P < 0.01; *: P < 0.05). No significant effect of sampling year was found for species listed in (b). Within the context of organic rotations in Europe, this study addresses two contrasting aspects of weeds in agricultural rotations, namely weed control and weeds as constituents of farm biodiversity. It highlights, therefore, the potential conflict between agronomic and biodiversity aspects of agricultural production. Overall, we found total weed cover in the range of 5.1-10.6 % in the on-farm trials, which is comparable to values of total weed cover in grass/clover leys reported in a study on weeds in organic rotations in the North of England . In the replicated trial at Barrington Park however, we observed much higher weed cover. It is likely that differences between these observations are due to different sampling times, since there is a large time effect on weed cover (Figure 2). In the replicated trials, crop biomass and weed biomass were inversely related (Figure 3), confirming earlier findings [e.g. [50, 51]]. Only one species deviated significantly from the regression between the two parameters relative weed biomass and relative crop biomass; meadow fescue had a lower weed biomass than would be predicted given its crop biomass (Figure 3). This result indicates that crop productivity, measured as above-ground biomass per unit area, is an excellent indicator of competitiveness against weeds. At the same time, this relationship may to some degree suggest functional complementarity between crops and weeds. In monocultures with relatively low crop biomass, weeds filled the gap, thus resulting in relatively high weed biomass. In arable cash crops there is (almost) no complementarity between crops and weeds. In terms of yield as the primary function of the cash crop, weeds make no direct positive contribution; on the contrary, weeds limit yields through competition. Leys with their associated weeds are different in this respect. Many functions are fulfilled by both the ley crop and weed species, e.g. covering the soil and thereby protecting it from erosion, providing plant residues for building up to soil organic matter or supporting pollinators and other beneficial insects. Although some central functions of the sown ley species such as nitrogen fixation are not fulfilled by the majority of weed species, there is at least some degree of functional complementarity between crops and weeds in rotational leys. Figure 4. Relationship between weed biomass and crop biomass in early autumn 2009, both expressed as relative difference (in %) of species values from respective site av- erages. Filled squares: Clover species (Trifolium spec. ); open squares: other legume species; grey triangles: grass species; open circles: All Species Mixtures (ASM); Grey di- amond: average of monocultures (only ASM components); Black line: linear regression through all points; broken line: y = –x. Mean of five sites (all except Barrington Park). IM: Inoculated All Species Mixture; NM: Non-inoculated All Species Mixture; other abbreviations see Table 1. Apart from this, there is a further important difference between weeds in leys and weeds in arable cash crops. 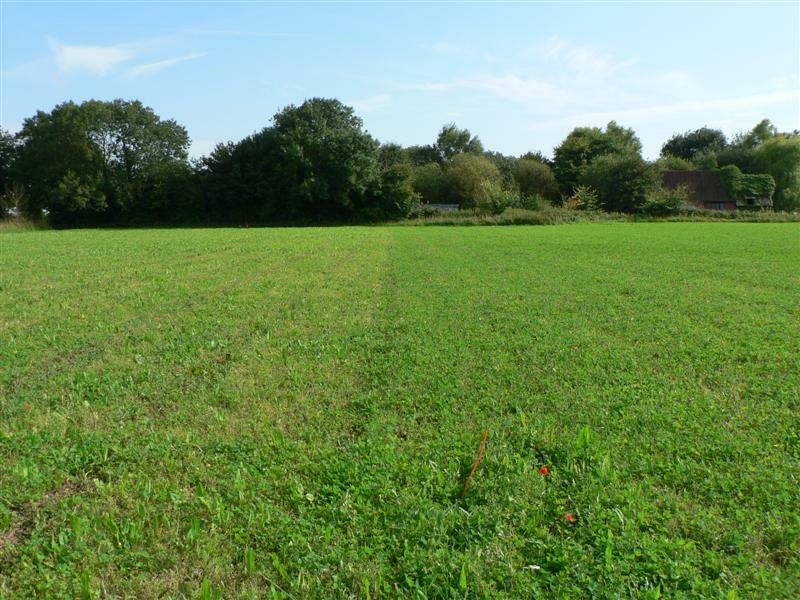 In leys, the time between emergence of weeds and their destruction through mowing is typically shorter than between weed emergence and harvest of arable crops. Therefore, many annual weed species may not have completed their life cycle and set seed before the ley is cut. In fact, the first cut of organic leys is often timed before weeds have produced seed. For these reasons, we suggest that weeds can be tolerated in organic leys to a higher degree than in organic cash crops. However, it is currently unclear where the balance lies between functional complementarity and functional antagonism of sown ley species vs. weeds. In this study, we found that the proportion of weeds and crops in total above-ground biomass did not significantly change between the first and the last sampling time for most species (Figure 3); this result is unexpected because of the asymmetry of competition typically observed in plant communities . With asymmetric competition it would be predicted that proportions of crops or weeds change over time, as the competition dynamics lead to shifts in the proportion of species towards the dominating species. There may be several reasons why our observations do not support the expectations arising from asymmetric competition. First, the sampling effort may have been insufficient to detect significant effects over time. Similarly, the study period may not have been long enough for asymmetric competition to become apparent. Also, in leys, competition between crops and weeds may be reset to a certain degree with each cut and with the break in vegetative growth over winter. While spring-germinating annual weed species form a new generation each spring, most legumes tested here are perennials, but they also need to re-grow after winter, or after cutting. In contrast to most of the ley species assessed in this study, in three species we found significant shifts over time in the proportion of weeds, namely white sweet clover and meadow pea (towards an increasing proportion of weeds), as well as timothy grass (towards an increasing proportion of the crop). In the cases of meadow pea and sweet clover, the observed increase in the proportion of weeds was likely due to poor recovery of plant growth following mowing. Large variation across sites (indicated by large standard errors) was observed for crimson clover with respect to the change of weed proportion over time (Figure 3). This species is annual but is able to re-grow from seed; here, shifts over time in the proportion of crops and weeds may reflect variation in the ability of the crop to produce a second generation. Differences observed among species in their competitiveness against weeds may to some extent reflect the intensity of plant breeding efforts. It is indeed reasonable to assume that there is a positive feedback relationship between a species’ productivity and the breeding efforts dedicated to it. For instance, both red clover and white clover, in this study found to be the two species with the strongest weed suppression (Figure 4), have received much more attention from breeders than the other legume species trialled here, which can be interpreted both as a reason for and a consequence of the relatively high productivity of white and red clover. Further, this study found that grasses outperformed legumes in terms of weed suppression, which is in line with earlier findings on the smaller weed suppression abilities of legumes in comparison to grasses [e.g. [13, 15]. The analysis of the individual legume species also shows that there is a degree of redundancy in the ASM, where some species (such as meadow pea) perform too poorly to warrant an inclusion in ley mixtures. Thus, mixtures with fewer species, but with complementary functions, may optimise weed management (and crop performance) in leys. This has been supported by analyses of potential mixtures with different numbers of the species trialled in this study . This study suggests that several weed species are dominant in organically managed leys typical in the UK and that weed species richness may be higher than previously reported . With the dominating Stellaria media, Sonchus arvensis and Veronica persica we found species that are common and typical annual weeds of arable fields in the UK and throughout Western Europe. With their short life cycles they are adapted to high-disturbance regimes. With an average value of 11.9, the number of weed species encountered per farm was slightly greater than in a single-site study investigating the effects of rotations on weeds, where 9 weed species were recorded from a grass/clover ley . Further, our results showed that annual weed species typical for arable fields were dominant in the year of establishment of the ley. In terms of weed communities the start of the ley phase is thus similar to those found in arable crops. On some sites, the ley was, in fact, undersown into cereals. Further, the weed community changed considerably in the second year, towards perennial and grassland species, most probably owing to the cessation of tillage and the repeated cutting, mulching or grazing. This change in community composition from annual to perennial species following the changes in land managed is typical and has been observed in several other studies [e.g. [13, 53]]. However, as pointed out in the Methods section, the sampling strategy for the weed species in the on-farm trials was not designed to generate an exhaustive picture of the weed flora in organic fertility building leys. In particular, because of spatial aggregation in weeds , the number of quadrats for sampling in on-farm trials was likely too small to reliably detect all species present on the leys. Therefore, it is likely that the data obtained for species richness on the organic leys underestimate the actual weed species richness [cf. ]. Similarly, the actual frequency of species on the farms, i.e. the proportion of farms on which a given species is present, is likely to be higher than measured with our sampling method. Further, the methods applied here do not allow us to build a picture of the weed species present in the seed bank. Finally, it is not known to which degree the ley management, e.g. cutting vs. grazing, had an impact on weed communities but this aspect was outside the scope of this study. Compared to the average of monocultures, the ASM was found to have significantly lower weed cover (Figure 2), and ranked among the best performers with regard to both crop biomass and weed biomass (Figure 3). However, these effects cannot be ascribed to the mixing of species, since diversity effects and density were confounded in this study. Seed density in the ASM was 53.4 % higher than the average seed density of all component monocultures. In the on-farm trials, ASM was not significantly better at controlling weeds than the control leys. However, sowing rates for the control leys were not recorded. It remains therefore speculative whether differences in seed densities between ASM and control leys might be a reason for the observed results. Generally, there is evidence that mixing species does help to control weeds, especially when crops are functionally diverse . A study on weeds in short-term grassland showed weed suppression to be higher in mixtures than in monocultures . Weed suppression in annual species mixtures has also been found to be better than in monocultures [46, 57, 58]. Further, because of functional complementarity among different sown species, seed densities in multi-species mixtures may generally be increased above the sowing rates used in respective monocultures or simpler mixtures with a lesser degree of complementarity. Thus, higher plant densities – made possible by mixing multiple species – may then be used as a tool to suppress weeds . At the same time, further research is necessary to separate species richness effects on weeds from the impact of plant density in leys. Our on-farm trials show that weed species richness as a component of farm biodiversity is not significantly reduced when including more crop species in the ley, in contrast to earlier findings . Weed species richness in the ley is more likely to be influenced by the history and landscape features  of any particular site. In the first year of establishment, leys may be seen to provide a suitable habitat for arable weeds. For the later stages of the ley, whilst annual weed species decline, the challenge remains to control perennial weeds such as creeping thistle (Cirsium arvense) and docks (Rumex spp.). However, we speculate that these species are again likely to be mostly influenced by site history (e.g. tillage ) and to be relatively unaffected by the choice of species in a ley mixture. In the past, the question of what organic agriculture contributes to the conservation of farmland biodiversity has been researched extensively , showing biodiversity benefits of organic farming in comparison with conventional farming [64, 65]. In this debate, little attention has so far been paid to organic leys, despite legume based leys being an essential feature of many organic systems, in particular in Europe. No direct comparison is therefore possible with conventional agriculture, because typically there is no ley phase in current conventional rotations [e.g. [66, 67]]. Organic leys add to the diversity on farms by including a range of crop species that are otherwise not cultivated. This study has shown that organic leys harbour a range of wild plant species that further contribute to species richness on the farm. Recent evidence shows that young leys ( < 1.5 years old) provide a better habitat for spiders than cereal fields . Leys therefore constitute an important element of farm biodiversity. As we have demonstrated, the choice of species in organic leys can be used to optimise weed control. It remains open to determine to which degree the ecological functions provided by weeds may be fulfilled by designing targeted crop mixtures, i.e. by replacing weeds with crops while maintaining their ecological functions. However, it is unlikely that effective protection of rare weed species can be achieved through ley design only. Further research is needed to show how leys can be optimized for multifunctional performance. This study was carried out as part of the Legume LINK project LK09106 which was supported by the Sustainable Arable LINK programme by the Department of Environment, Forestry and Rural Affairs (DEFRA), UK. We would like to thank all farmers involved in this project for their participation and commitment, and Organic Seed Producers (OSP) for providing seed. Smil V. Nitrogen cycle and world food production. World Agriculture. 2011;2(1):9–13. Canfield DE, Glazer AN, Falkowski PG. The evolution and fu- ture of Earth’s nitrogen cycle. science. 2010;330(6001):192–196. doi:10.1126/science.1186120. Larsen TA, Erisman J. Nitrogen economy of the 21st century. In: Larsen T, Udert K, Lienert J, editors. Source separation and decen- tralization for wastewater management. London, UK: IWA Publishing; 2013. pp. 45–58. Peoples MB, Herridge DF, Ladha JK. In: Ladha JK, Peoples MB, editors. Biological nitrogen fixation: An efficient source of nitrogen for sustainable agricultural production? Dordrecht: Springer Nether- lands; 1995. pp. 3–28. doi:10.1007/978-94-011-0055-7 1. Olivares J, Bedmar EJ, Sanju´ an J. Biological nitrogen fixation in the context of global change. Molecular Plant-Microbe Interactions. 2013;26(5):486–494. doi:10.1094/mpmi-12-12-0293-cr. Franche C, Lindstr¨ om K, Elmerich C. Nitrogen-fixing bacteria asso- ciated with leguminous and non-leguminous plants. Plant and soil. 2009;321(1-2):35–59. doi:10.1007/s11104-008-9833-8. Long SR. Rhizobium-legume nodulation: life together in the underground. Cell. 1989;56(2):203–214. doi:10.1016/0092- 8674(89)90893-3. Hauggaard-Nielsen H, de Neergaard A, Jensen LS, Høgh-Jensen H, Magid J. A field study of nitrogen dynamics and spring bar- ley growth as affected by the quality of incorporated residues from white clover and ryegrass. Plant and Soil. 1998;203(1):91–101. doi:10.1023/A:1004350215467. Watson C, Atkinson D, Gosling P, Jackson L, Rayns F. Managing soil fertility in organic farming systems. Soil Use and Management. 2002;18(s1):239–247. doi:10.1111/j.1475-2743.2002.tb00265.x. Lampkin N. Organic Farming. Ipswich, UK: Farming Press; 1994. Evers GW. Forage legumes: forage quality, fixed ni- trogen, or both. Crop science. 2011;51(2):403–409. doi:10.2135/cropsci2010.06.0380. Freyer B. Fruchtfolgen—konventionell, integriert, biologisch. Stuttgart, Germany; 2003. Ivins J. Weeds in relation to the establishment of the ley. Grass and Forage Science. 1950;5(3):237–242. doi:10.1111/j.1365- 2494.1950.tb01287.x. Jones H. Consultation on fertility building leys among organic farmers in the UK. Hamstead Marshall, UK: Organic Research Centre; 2008. Brainard DC, Bellinder RR, Kumar V. Grass-legume mixtures and soil fertility affect cover crop performance and weed seed produc- tion. Weed Technology. 2011;25(3):473–479. doi:10.1614/wt-d-10- 00134.1. Ross SM, King JR, Izaurralde RC, O’Donovan JT. Weed suppression by seven clover species. Agronomy Journal. 2001;93(4):820–827. doi:10.2134/agronj2001.934820x. Bond W, Grundy A. Non-chemical weed management in or- ganic farming systems. Weed Research. 2001;41(5):383–405. doi:10.1046/j.1365-3180.2001.00246.x. Eyre M, Critchley C, Leifert C, Wilcockson S. Crop sequence, crop protection and fertility management effects on weed cover in an organic/conventional farm management trial. European Journal of Agronomy. 2011;34(3):153–162. Picasso VD, Brummer EC, Liebman M, Dixon PM, Wilsey BJ. Crop species diversity affects productivity and weed suppression in peren- nial polycultures under two management strategies. Crop Science. 2008;48(1):331–342. doi:10.2135/cropsci2007.04.0225. Tracy B, Sanderson M. Relationships between forage plant di- versity and weed invasion in pasture communities. Agriculture, Ecosystems & Environment. 2004;102:175–183. doi:10.1016/s0167- 8809(03)00280-9. Sprenger B, Belde M. Auflaufraten von Ackerwildpflanzen auf ¨ okologisch bewirtschafteten Fl¨ achen des Forschungsverbundes Agrar¨ okosysteme M¨ unchen (FAM). Vienna, Austria; 2003. Lukashyk P, Berg M, K¨ opke U. Strategies to control Canada thistle (Cirsium arvense) under organic farming condi- tions. Renewable Agriculture and Food Systems. 2008;23:13–18. doi:10.1017/s1742170507002013. Melander B, Holst N, Rasmussen IA, Hansen PK. Direct control of perennial weeds between crops–Implications for organic farming. Crop Protection. 2012;40:36–42. doi:10.1016/j.cropro.2012.04.029. Younie D. Grass clover ley species, variety selection and manage- ment. Craven Arms, UK; 2008. B` arberi P. Weed management in organic agriculture: are we ad- dressing the right issues? Weed Research. 2002;42(3):177–193. doi:10.1046/j.1365-3180.2002.00277.x. van Elsen T. Species diversity as a task for organic agriculture in Eu- rope. Agriculture, ecosystems & environment. 2000;77(1):101–109. doi:10.1016/s0167-8809(99)00096-1. Andreasen C, Stryhn H. Increasing weed flora in Danish arable fields and its importance for biodiversity. Weed Research. 2008;48(1):1–9. doi:10.1111/j.1365-3180.2010.00836.x. Gabriel D, Tscharntke T. Insect pollinated plants benefit from organic farming. Agriculture, Ecosystems & Environment. 2007;118(1):43–48. doi:10.1016/j.agee.2006.04.005. Pocock MJ, Evans DM, Memmott J. The robustness and restoration of a network of ecological network. Science. 2012;335(6071):973–977. doi:10.1126/science.1214915. Evans DM, Pocock MJ, Brooks J, Memmott J. Seeds in farmland food-webs: resource importance, distribution and the impacts of farm management. Biological Conservation. 2011;144(12):2941–2950. doi:10.1016/j.biocon.2011.08.013. Barberi P, Burgio G, Dinelli G, Moonen A, Otto S, Vazzana C, et al. Functional biodiversity in the agricultural landscape: relationships be- tween weeds and arthropod fauna. Weed Research. 2010;50(5):388– 401. doi:10.1111/j.1365-3180.2010.00798.x. Cardinale BJ, Matulich KL, Hooper DU, Byrnes JE, Duffy E, Gamfeldt L, et al. The functional role of producer diversity in ecosystems. American Journal of Botany. 2011;98(3):572–592. doi:10.3732/ajb.1000364. Harrington K, Thatcher A, Kemp P. Mineral composition and nu- tritive value of some common pasture weeds. New Zealand Plant Protection. 2006;59:261–265. Brown RJ. Dual biodiversity benefits from legume-based mixtures [PhD Thesis]. University of Reading; 2014. Clough Y, Holzschuh A, Gabriel D, Purtauf T, Kleijn D, Kruess A, et al. Alpha and beta diversity of arthropods and plants in organically and conventionally managed wheat fields. Journal of Applied Ecology. 2007;44(4):804–812. doi:10.1111/j.1365-2664.2007.01294.x. Gabriel D, Roschewitz I, Tscharntke T, Thies C. Beta diversity at different spatial scales: plant communities in organic and conven- tional agriculture. Ecological Applications. 2006;16(5):2011–2021. doi:10.1890/1051-0761(2006)016[2011:bdadss]2.0.co;2. Fisk JW, Hesterman OB, Shrestha A, Kells JJ, Harwood RR, Squire JM, et al. Weed suppression by annual legume cover crops in no-tillage corn. Agronomy Journal. 2001;93(2):319–325. doi:10.2134/agronj2001.932319x. D¨ oring TF, Baddeley JA, Brown R, Collins R, Crowley O, Cuttle S, et al. Using legume-based mixtures to enhance the nitrogen use efficiency and economic viability of cropping systems. Stoneleigh Park, UK: Agriculture and Horticulture Development Board; 2013. Final report LK09106/HGCA3447. Gross N, Suding K, Lavorel S, Roumet C. Complementarity as a mechanism of coexistence between functional groups of grasses. Journal of Ecology. 2007;95(6):1296–1305. doi:10.1111/j.1365- 2745.2007.01303.x. Tilman D, Reich PB, Knops J, Wedin D, Mielke T, Lehman C. Diver- sity and productivity in a long-term grassland experiment. Science. 2001;294(5543):843–845. doi:10.1126/science.1060391. Hector A. The effect of diversity on productivity: detecting the role of species complementarity. Oikos. 1998;pp. 597–599. doi:10.2307/3546380. Storkey J, D¨ oring T, Baddeley J, Collins R, Roderick S, Jones H, et al. Engineering a plant community to deliver multiple ecosystem services. Ecological Applications. 2015;25(4):1034–1043. doi:10.1890/14- 1605.1. Rosenfeld A, Rayns F. Sort Out Your Soil: A practical guide to green manures. Cotswold Business Village, UK: Cotswold Grass Seeds; 2011. Available from: https://www.cotswoldseeds.com/files/ cotswoldseeds/Sort%20Out%20Your%20Soil.pdf. Aufhammer W. Mischanbau von Getreide-und anderen K¨ orner- fruchtarten: ein Beitrag zur Nutzung von Biodiversit¨ at im Pflanzenbau. Stuttgart, Germany; 1999. Wolfe M, Fradgley N, Winkler L, Doring T. Beans and wheat inter- cropping: a new look at an overlooked benefit. In: Organic Research Centre Bulletin. vol. 112. Hamstead Marshall, UK; 2013. pp. 8–9. Hauggaard-Nielsen H, Andersen MK, Joernsgaard B, Jensen ES. Density and relative frequency effects on competitive interactions and resource use in pea–barley intercrops. Field Crops Research. 2006;95(2):256–267. doi:10.1016/j.fcr.2005.03.003. R Core Team. R: A Language and Environment for Statistical Com- puting. Vienna, Austria; 2017. Available from: https://www.R- project.org/. Real R. Tables of significant values of Jaccard’s index of similarity. Miscell` ania Zool` ogica. 1999;22(1):29–40. Hiltbrunner J, Liedgens M, Bloch L, Stamp P, Streit B. Legume cover crops as living mulches for winter wheat: components of biomass and the control of weeds. European Journal of Agronomy. 2007;26(1):21– 29. doi:10.1016/j.eja.2006.08.002. B` arberi P, Mazzoncini M. Changes in weed community composition as influenced by cover crop and management system in continu- ous corn. Weed Science. 2001;49(4):491–499. doi:10.1614/0043- 1745(2001)049[0491:ciwcca]2.0.co;2. Weiner J. Asymmetric competition in plant populations. Trends in Ecology & Evolution. 1990;5(11):360–364. doi:10.1016/0169- 5347(90)90095-u. D¨ olle M, Bernhardt-R¨ omermann M, Parth A, Schmidt W. Changes in life history trait composition during undisturbed old-field succes- sion. Flora-Morphology, Distribution, Functional Ecology of Plants. 2008;203(6):508–522. doi:10.1016/j.flora.2007.07.005. Pollnac F, Rew L, Maxwell B, Menalled F. Spatial patterns, species richness and cover in weed communities of organic and conventional no-tillage spring wheat systems. Weed Research. 2008;48(5):398– 407. doi:10.1111/j.1365-3180.2008.00631.x. Suter M, Hofer D, L¨ uscher A. Weed suppression enhanced by in- creasing functional trait dispersion and resource capture in forage ley mixtures. Agriculture, Ecosystems & Environment. 2017;240:329– 339. doi:10.1016/j.agee.2017.01.007. Finn JA, Kirwan L, Connolly J, Sebasti` a MT, Helgadottir A, Baad- shaug OH, et al. Ecosystem function enhanced by combining four functional types of plant species in intensively managed grassland mixtures: a 3-year continental-scale field experiment. Journal of Ap- plied Ecology. 2013;50(2):365–375. doi:10.1111/1365-2664.12041. Hauggaard-Nielsen H, Ambus P, Jensen ES. Interspecific competi- tion, N use and interference with weeds in pea–barley intercropping. Field Crops Research. 2001;70(2):101–109. doi:10.1016/s0378- 4290(01)00126-5. Saucke H, Ackermann K. Weed suppression in mixed cropped grain peas and false flax (Camelina sativa). Weed Research. 2006;46(6):453–461. doi:10.1111/j.1365-3180.2006.00530.x. Weiner J, Andersen SB, Wille WKM, Griepentrog HW, Olsen JM. Evolutionary Agroecology: the potential for cooperative, high den- sity, weed-suppressing cereals. Evolutionary Applications. 2010;3(5- 6):473–479. doi:10.1111/j.1752-4571.2010.00144.x. Palmer MW, Maurer TA. Does diversity beget diversity? A case study of crops and weeds. Journal of Vegetation Science. 1997;8(2):235– 240. doi:10.2307/3237352. Boutin C, Baril A, Martin P. Plant diversity in crop fields and woody hedgerows of organic and conventional farms in contrasting land- scapes. Agriculture, Ecosystems & Environment. 2008;123(1):185– 193. doi:10.1016/j.agee.2007.05.010. Schulz F, Leithold G. Effekte von Fruchtfolge und Bodenbearbeitung auf die Segetalflora im ¨ Okologischen Landbau. Julius-K¨ uhn-Archiv. 2014;(443):441. doi:10.5073/jka.2014.443.055. Schneider MK, L¨ uscher G, Jeanneret P, Arndorfer M, Ammari Y, Bailey D, et al. Gains to species diversity in organically farmed fields are not propagated at the farm level. Nature Communications. 2014;5:4151. doi:10.1038/ncomms5151. Gibson R, Pearce S, Morris R, Symondson WOC, Memmott J. Plant diversity and land use under organic and conventional agriculture: a whole-farm approach. Journal of Applied Ecology. 2007;44(4):792– 803. doi:10.1111/j.1365-2664.2007.01292.x. Tuck SL, Winqvist C, Mota F, Ahnstr¨ om J, Turnbull LA, Bengtsson J. Land-use intensity and the effects of organic farming on biodi- versity: a hierarchical meta-analysis. Journal of Applied Ecology. 2014;51(3):746–755. doi:10.1111/1365-2664.12219. Ulber L, Steinmann HH, Klimek S, Isselstein J. An on-farm ap- proach to investigate the impact of diversified crop rotations on weed species richness and composition in winter wheat. Weed Research. 2009;49(5):534–543. doi:10.1111/j.1365-3180.2009.00722.x. Potts G, Ewald J, Aebischer N. Long-term changes in the flora of the cereal ecosystem on the Sussex Downs, England, focusing on the years 1968–2005. Journal of Applied Ecology. 2010;47(1):215–226. doi:10.1111/j.1365-2664.2009.01742.x.